Cook coffee first and let it cool in a bowl. Separate egg white and egg yolk, use egg yolk only. Mix well egg yolk with sugar. Add vanillin sugar and Cointreau. Move the mascarpone by hand. Add a bit of lemon skin before finishing with the mascarpone. Keep the mass in the fridge (raw egg is delicate!) and start working with the Savoiardi. Roll each Savoiardi in the coffee (it need to soak the coffee in but not be too wet to fall apart). If you want to prepare servings by glass like in the photo above, then break on Savoiardi in half and lay in each glass 1 biscuit broken in half. You will get 12 servings. If you want smaller servings, use espresso cups and use only half biscuit for each cup. You will get 24 servings. You can also prepare one large container and serve by spoon. After the first layer of biscuits, add a layer of egg-mascarpone-mass on top. Add another layer of biscuit. Top with a last layer of egg-mascarpone-mass. Sieve dark chocolate powder on top. Cover with clear wrapping or aluminium foil and keep in the fridge at least for 4 h before serving. Before serving sieve one more time a bit of chocolate powder on top. Although raw eggs are delicate, and you will only use freshly bought eggs, you could prepare the tiramisu the night before serving it as it even taste better the longer the Savoiardi biscuits are soaked with all the flavors. Don't use the electric mixer for working the mascarpone. Work only with a hand mixer and do not over-do it as some mascarpone is more delicate than others and its consistency might become liquid. 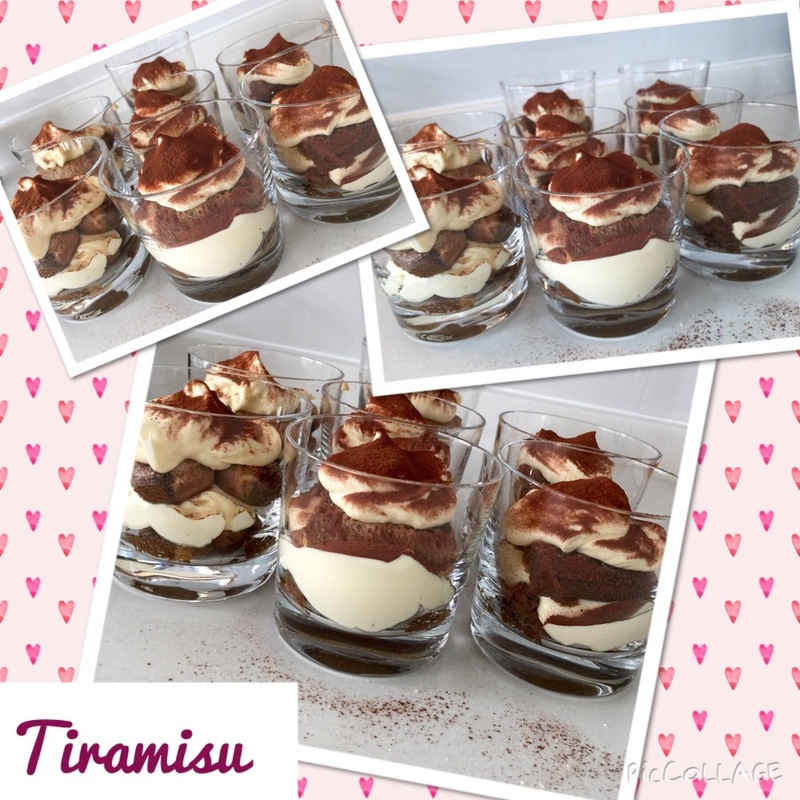 To rescue the desert you would then need to freeze it and serve "tiramisu ice cream". Some more recent recipes include beaten white egg or cream. This results in double of the amount of mass. It might appear more light, but it is also more liquid and has a more intense egg taste. It's very easy when you have a food processor at home that mixes your ingredients into a delicious pesto sauce in just a few seconds. Else you can use a mortar. This amount of ingredients resulted in about 300 gr of fresh basil pesto sauce and could be stored in 2-3 glass containers. 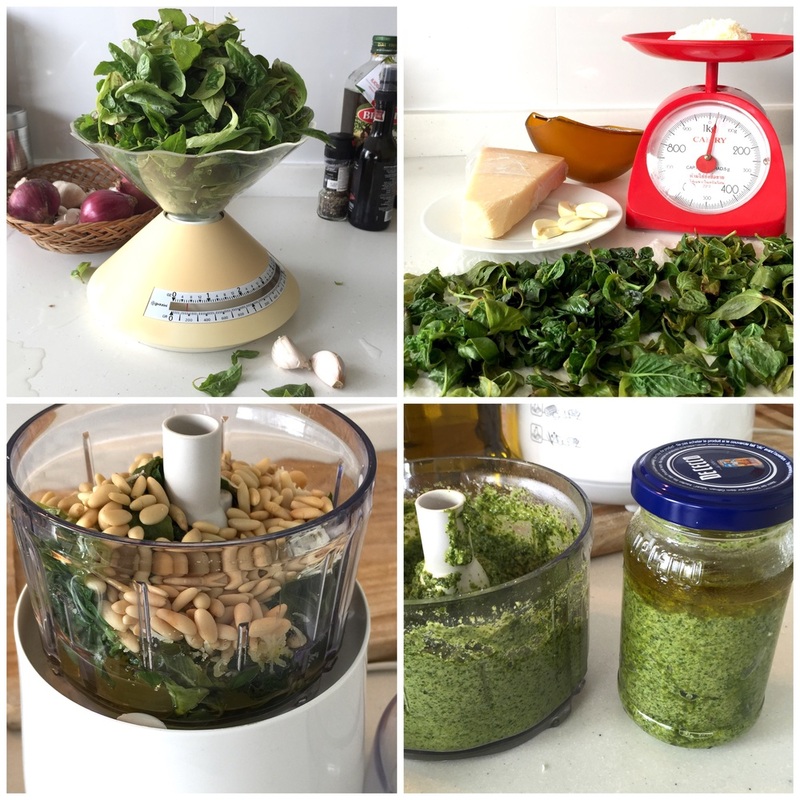 300 gr pesto could be served with 500 gr pasta and make up to 5-6 servings. - Cook water in a pot with salt. - Clean the basil leaves by washing. Shortly blanch the the basil in boiling water. This is the "secret" to keep the leaves green (after the blending) and take away a bit of the bitterness. - Take the leaves out and dry them on kitchen paper. - In the meantime grate Parmesan cheese and peal the garlic. - Then throw half of the ingredients in the food processor (to reduce the volume), add some olive oil. Later add the rest. Taste the pesto to add ingredients up to your taste. How to serve: If you serve pasta with pesto alla Genevese boil a medium size potatoe (cut into small cubes) in the pasta water. Before pouring out the water, use one ladle of the cooking water to add into the sauce.Then add the pasta. Add more parmesan cheese on top of each serving, decorate with a basil leave and some pine nuts. Bon appetito! While mixing the ingredients taste the pesto and adjust it to your taste. You can use less garlic (but at least 1 clove for the spice), you can use more Parmesan or Pecorino cheese, more salt, more pines, more oil. The sauce might become less green though. If you don't use the pesto right away, store it in a glass jar and top the surface entirely with olive oil. You can easily cover the surface with olive oil and freeze the glass jar up to a couple of months. Don't make the mistake and serve spaghetti with pesto - it's the wrong pasta! Classic Italian style is to serve linguine with pesto! Or another flat pasta (bavette, fettuccine). But I like to dine and wine with friends. So I try my best. And I enjoy it more and more. However, I am still better with deserts. That's why I need to write down all what I managed to cook well. And as paper gets messy over time and in the kitchen, I decided to file my favorite recipes here. Along with my favorite recipe websites. Always available online, even when travelling.